We had a GREAT run for CHICAGO! The audiences were "screaming and begging for more" every night & the critics agree that this was a wonderful production. 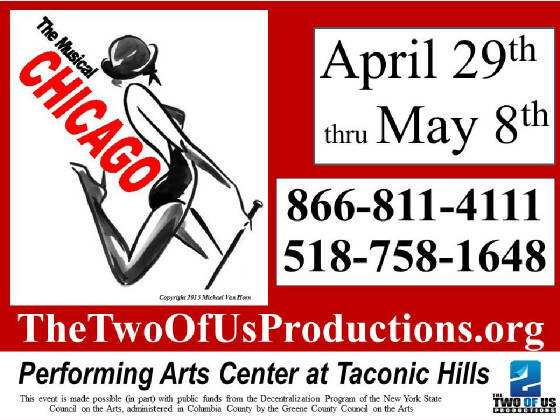 CRARYVILLE, NY --The Two Of Us Productions, the award winning theater company based in Columbia County NY, is pleased to present CHICAGO, The Musical April 29th through May 8th, 2016 in the well-equipped Performing Arts Center At Taconic Hills. This Broadway hit is a saucy mix of finger snappin' music, sly humor, and Bob Fosse's eye-catching choreography, all backed up by a live orchestra in this full-throated production by The Two Of Us Productions. CHICAGO, The Musical tells the true to life story of two aspiring showgirls, Roxie Hart & Velma Kelly. Each has landed in jail, accused of murder, and they're both conniving to parlay their sudden fame into successful show business careers. With music by John Kander, lyrics by Fred Ebb and a book by Ebb and Bob Fosse, CHICAGO, The Musical is set in Prohibition-era Chicago. The show is based on a 1926 play of the same name by reporter Maurine Dallas Watkins about actual criminals and crimes she reported on. CHICAGO is known for the distinctive dancing style of Bob Fosse, with added choreography by Ann Reinking. The energizing music, distinctive singing and dancing, and entertaining story all add up to a powerful musical comedy you will not want to miss! This new production features Constance Lopez as Roxie Hart & Alissa Wyatt as Velma Kelly. The strong and experienced cast features the silver-tongued defense lawyer Billy Flynn (Brian Yorck); the hard-boiled prison matron Mama Morton (Diane Boice-Yorck), Roxie's meek husband Amos Hart (Brian Mauch), and the ever-optimistic Mary Sunshine (M. Leinung). The strong dancing & singing ensemble for this razzle dazzle production includes: Conor Anderson, Owen Berth, Sherri Lewis, Kim Mauch, Nicole Molinski, Cyndi Miller, John Peterson, Betsy Rees, Madison Seipp, Jennie Smyth, Samantha Szepessy, Debra Jo Tice Hughes, Mike Van Horn, & Bethany Wharton. This event is made possible (in part) with public funds from the Decentralization Program of the New York State Council on the Arts, administered in Columbia County by the Greene County Council on the Arts. The Two of Us Productions is well known throughout the Hudson Valley for presenting quality theater, both musicals and dramas. Their recent productions of Les Miserables, next to normal and Jesus Christ Superstar were recognized by the Theatre Association of NY with multiple awards, including outstanding work by the company & outstanding performance by the orchestra. One of their trademarks is presenting musicals with full orchestras, a rarity that is a great treat for their audiences. They have performed at a variety of venues throughout the area including: Jesus Christ Superstar, Into The Woods, Spamalot and the NE regional premiere of Ragtime at the Performing Arts Center at Taconic Hills in Craryville, NY; the NE regional premieres of next to normal and Tale of Two Cities in Hudson, NY. Oliver at the BCC Boland Theater in Pittsfield, MA; Arthur Miller's Broken Glass at the Valatie Community Theatre in Valatie, NY; The Owl and the Pussycat at the Cuneen-Hackett Theater in Poughkeepsie, NY; Cabaret & Christopher Durang's Beyond Therapy at Stageworks/Hudson; John Pielmeier's Agnes of God at The Lichtenstein Center for the Arts in Pittsfield, MA; and They're Playing Our Song at the Rhinebeck Center for Performing Arts. 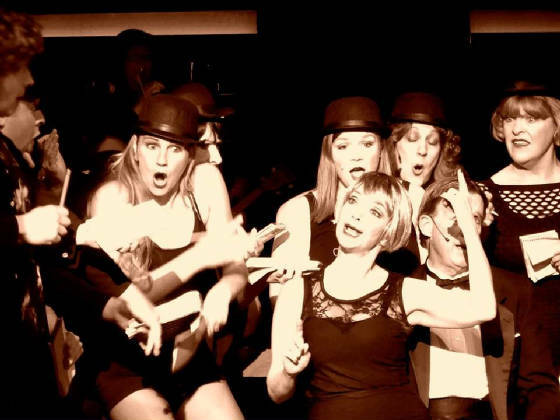 Performances of CHICAGO, The Musical are 2 weekends only: April 29th, April 30th, & May 1st, and the following weekend of May 6th, 7th, & 8th, 2016. Friday and Saturday performances are at 7:30pm and Sunday matinees are at 3pm. The well-equipped performing arts center at Taconic Hills in Craryville, NY is one of the premiere theater venues in the area. Tickets are $20 for adults, $14 for students & seniors, and $12 for groups & families. For advance reservations visit www.TheTwoOfUsProductions.org or call 1-866-811-4111 or 518-758-1648. Make your reservations early for the best seats on the date you want!